Note to self, and to everyone reading this – do not buy Kylie Cosmetics. I got swept up in a Christmas makeup frenzy back in November 2017, so many tempting festive eyeshadow palettes and lipsticks. I’ve been bitten by Kylie’s terrible returns policy before (which is pretty much lump it or like what we send, there’s no refunds), plus the customs charges to pay on top of the slightly ridiculous prices – everything is from the same company that make the much cheaper Colour Pop brand, and has pretty much the same ingredients. 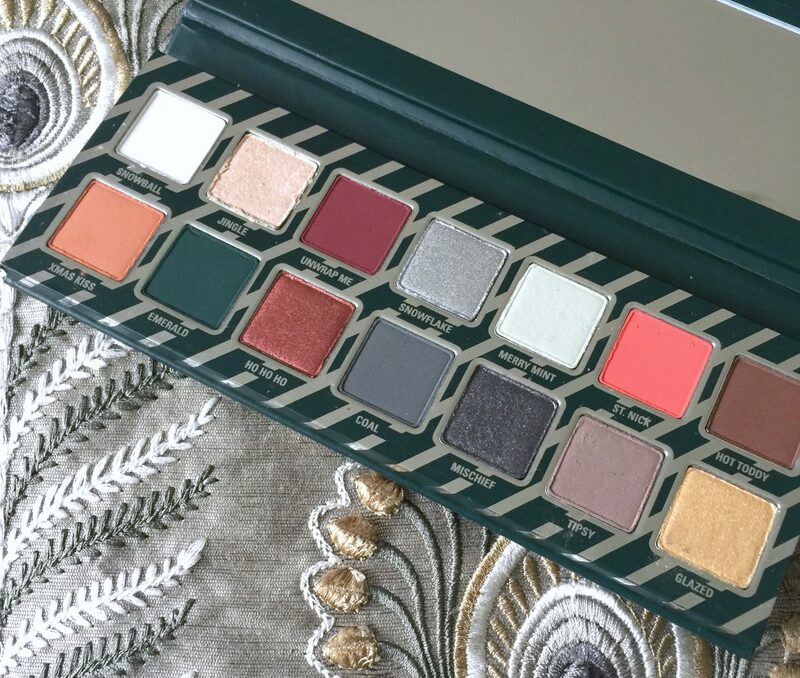 Yet foolishly I thought the Kylie Naughty and Nice palettes were cute, and would make a good Christmas makeup post. I bought them in November, the money was taken from my account. I only got Naughty delivered to me in February 2018, and they haven’t yet refunded me for Nice which is now out of stock. The customer service emails are garbage, just people typing from a script. Yes, I’ve got consumer rights and can pursue that refund, it’s just all such a faff. Never again will I buy from Kylie Cosmetics, the company that’s all about the face behind the brand rather than the products themselves. No wonder Kylie’s older sis, Kim, thought she’d have a bit of this easy money and launched her own makeup line. 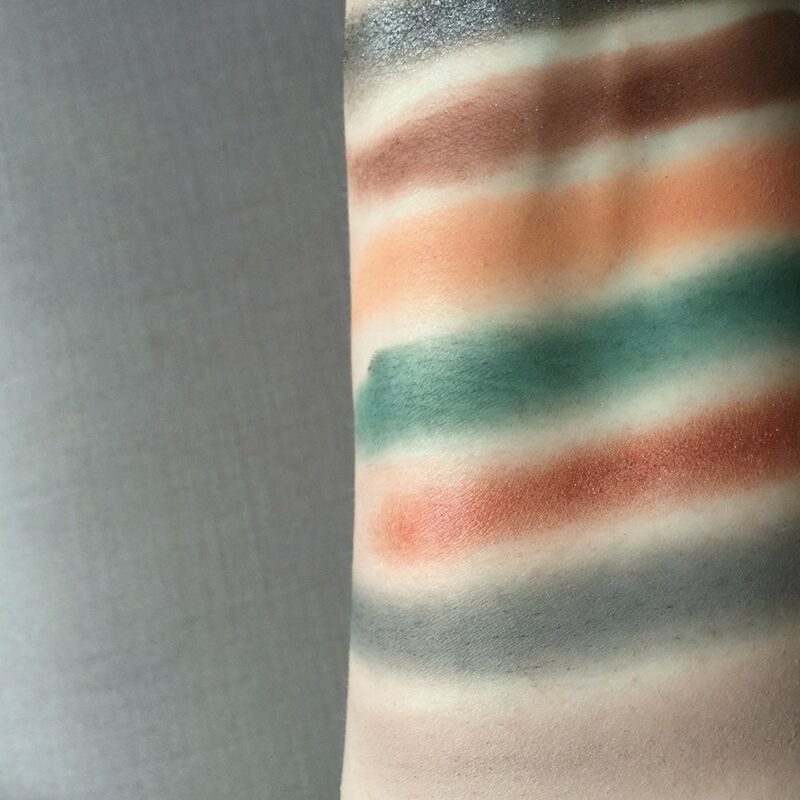 I’m not exactly blown away by the Naughty palette, it wasn’t worth the two and a half month wait. 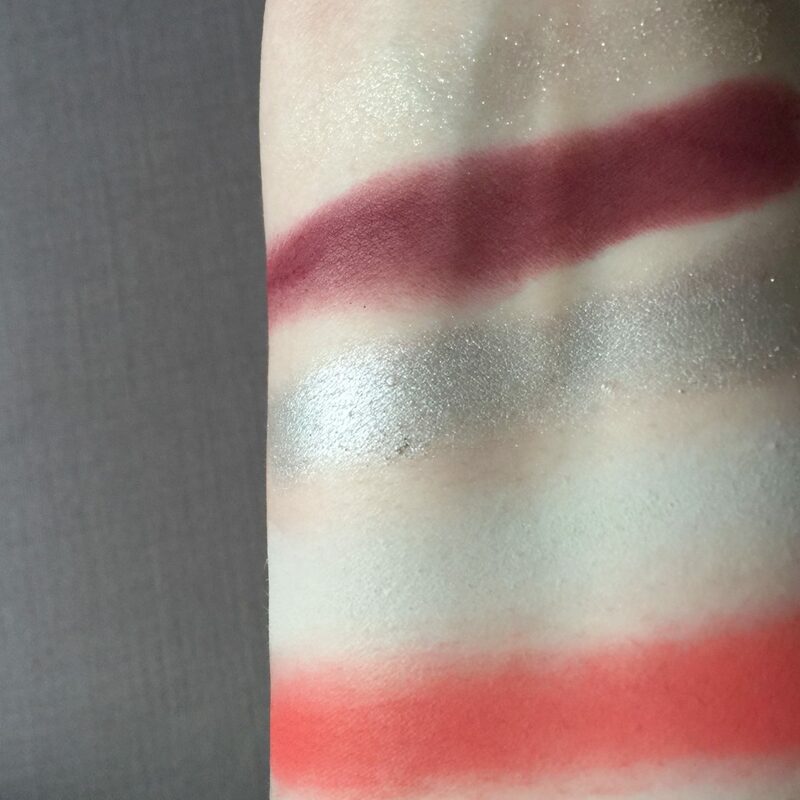 The Jingle pan (second from left on the top row) is barely fixed in the palette and is a horrible chunky glitter that literally scratches the skin (below, top swatch). Oops, I cut off the swatch of Mischief (below, top swatch), it’s actually a decent blue-black that would be good for a smoky eye. I’m so disappointed in Emerald, the green below, it’s more like a swamp green and really hard to work with. So many beauty gurus raved about Merry Mint, a supposedly pale green that I thought it would be a really original colour for my collection. It’s a blah greyish-white that barely shows up on my skin tone. Hot Toddy is a nice shade of warm brown, but the gold glitter in it easily blew away from my swatch and wouldn’t last on the lids. I love Tipsy, it’s my kind of everyday shade, and transition shades like Xmas Kiss are always useful, but these two were not worth the price of this palette, nor the long wait and the battle with customer services to get my Nice purchase money back. These shades are easily dupable, and you’d probably get better quality ones from drugstore brands. Naughty Kylie, indeed. Previous Post Who’s Behind The Blogger Re-Tweet Accounts? I’ve seen so many bad experiences with Kylie makeup – I wouldn’t touch with a barge pole! Hope you get your refund soon!! As nice as the Kylie products look, they’re just too expensive for what they are – I think the silver makeup brushes proved that! But I hope you find a way to enjoy your palette, and that the other one either shows up or is refunded. Thank you! Oh god I forgot about the brushes, weren’t they £300 or something? And no refunds if people didn’t like them, lol. I really want to explore higher end makeup products but it’s things like this that put me off, I need to know that if I’m spending a lot of money on it it’s going to be really really amazing and high quality not just something I could have picked up at Superdrug for £4! Kylie’s not high end, really. She’s still mid-range, but way too expensive for the quality. I’ve got some high end reviews in my makeup section if you want a closer look – Dior, Givenchy and Chanel. Woah, I had no idea their customer service was so bad! I can’t believe they took so long to ship too – two and a half months takes the piss. Thanks for sharing your experience though, I definitely won’t be tempted by Kylie Cosmetics anymore. That is disgusting! No wonder she makes so much money, practically fleasing people. I am so glad you wrote this review.